EVELYN Anemaet, a biologist from the National Wetlands Research Center, Louisiana, US, and her colleague, have devised a cheap method for constructing and installing dendrometer bands. Dendrometer bands are instruments used for measuring tree circumference. Construction of a conventional dendrometer band is expensive, time-taking and difficult. The band has to be made by hand from a bent and folded metal strip which has sharp edges. To avoid any injury, the worker has to wear thick gloves. An improperly constructed band could also damage the tree. As several dendrometer bands are required to studyÃ”Ã‡Ãªa large area, it is expensive. Anemaet and her colleague have prepared dendrometers using smooth-edged stainless steel bands, fixed with pre-fabricated cable-tie that keeps both the tree and the worker from getting injured. A spring is used to attach the two ends of the band. 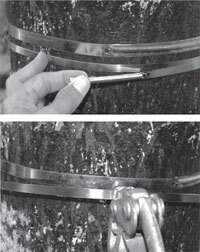 The spring has sufficient tension to keep the band snug to the tree and at the same time allows the tree to grow. As part of the study, they installed both conventional as well as modified dendrometer bands on 12 trees in the artificial wetlands of the research centre.Ã”Ã‡ÃªThey found that the time taken to install dendrometers using the modified cable-tie method was approximately two minutes faster than the traditional method under ideal (non-Â´Â¼Ã¼eld) conditions. Under Â´Â¼Ã¼eld conditions, traditional band construction took 30 minutes or more while the cable-tie method did not take more than 10 minutes. The study was published in the Journal of Plant Applications, on August 22. Tree trunks, typically, shrink during winter and expand in autumn. Tolerance to freezing temperatures is often a selection criterion in breeding programmes. Monitoring tree trunk diameter is an important component of ecological studies and forestry management.